The house at 432 Abercorn Street in Savannah is a dilapidated Greek Revival structure. The historic house sits on Calhoun Square, and like any building on one of Savannah’s squares, it’s a coveted piece of real estate. So why, then, does the building stand empty and, apparently, abandoned? Sixth Sense Tours’ Dawn Laxton has been researching the long and mysterious history of the house, although details have proven difficult to find. The house was built in 1868 for General Benjamin J. Wilson, a veteran of the Civil War. The General’s wife succumbed to yellow fever, leaving him to raise their daughter alone in the four-level house. Just across the street from the house is the Massey School, one of the oldest public schools in Savannah still in use today. General Wilson’s daughter loved to play with children who went to Massey School, but her father disapproved of her socializing with them. Undeterred, the little girl continued to run across the street to play with the other children. Legend says that, in his frustration, General Wilson punished his daughter by putting her in a chair in the living room window and tying her into place. She could see the other children playing outside and she could do nothing but sit and watch. When neighbors saw the little girl, they complained to General Wilson about his mistreatment of her. He responded by removing the ropes that bound the girl in place, but he ordered her to remain in the chair nonetheless. After a few days of sitting in such a humiliating position, the little girl died of heat stroke and dehydration. In those days before the advent of air conditioning, houses could become stiflingly hot, and the child’s position directly in front of the window made her even more susceptible. Years later, General Wilson also died in the home, but his death came naturally, unlike his daughter’s. The General and his daughter have never left, according to many. Dawn is just one of the tour guides I spoke to who says that tourists often take a picture of the house, only to find the image of a little girl sitting in one of the windows. Other tourists are less lucky: before they can snap a picture, their cameras shut down. In some extreme cases, Dawn has even seen smoke begin to curl up from cameras that worked just fine at every other spot on the tour. General Wilson’s face doesn’t show up in a window that of like his daughter’s. Instead, he can be seen looking out from the plaster next to the right-hand window on the second level. This living-room window is the one where his daughter purportedly died. Is the image of the old man’s face just a coincidental arrangement of cracks and discoloration in the plaster? 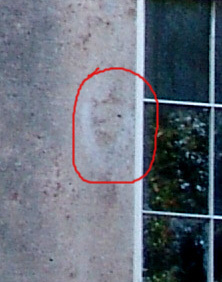 Even the pictures that I took, before I had heard the story, show what looks like the face of a man with a white beard, turning his face away from the window. As if the sad tale of General Wilson and his daughter isn’t enough, there are other mysterious tales surrounding the house. I first heard about the haunted house on Abercorn Street from “Hollywood” Ron Higgins during one of his Scary Ghost Tours. The story Ron uncovered deals with a much more recent tragedy at the house. In 1959, a family from Pompano Beach, Florida, came to visit the doctor and his family living at 432 Abercorn. The visiting family included four daughters, ranging in age from four to twelve. The adults went out one evening, and when they returned later they found three of the girls dead. Two of them were still inside the house, and one was sprawled on the front porch, as if she was slain while trying to escape. The youngest daughter, age four, was the only one still alive. The sad and senseless triple murder was never solved. In the 1990s, the house was briefly rented out and a lot of college students from nearby Savannah College of Art and Design lived there. They heard pounding, heavy pacing, crying and, even more mysterious, a lot of giggling. I spoke to a local resident who sometimes feels such a negative emotion emanating from the house that she can’t even walk past it. One of her acquaintances lived at the house for a time, but he disappeared while living there, and the mysterious circumstances make her wonder if his disappearance is somehow related to the paranormal activity at the house. Among all the ghost stories I’ve heard about Savannah over the years, I have never encountered a story like this one, in which people are so reluctant to tell the story and even more wary of going near the place. I’ve walked past in broad daylight and broken out in goose bumps. If you have a story or pictures to share about 432 Abercorn, e-mail me and I will post your information on this site. If you have a question shoot Beth an email and she'll get back to you, asap.